Joseph studied at the Royal College of Music, London, winning the Canon Bark Prize for most promising organ student, and was awarded First Class Honours for his final recital at the Temple Church, London. Scholarships from the Countess of Munster Trust, Hattori Foundation and the Royal Philharmonic Society supported his advanced studies with legendary organists Marie-Claire Alain in Paris and Dame Gillian Weir in London. 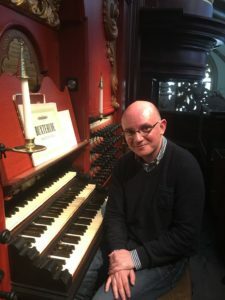 Appointed to Her Majesty’s Chapels Royal, St James’s Palace, in 2004, Joseph performed on numerous occasions at Buckingham Palace, most notably giving the opening concert of the refurbished Grand Ballroom organ to a distinguished audience.